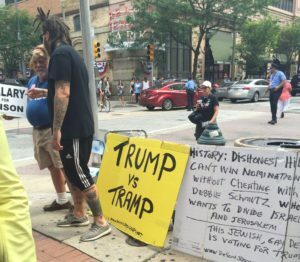 PHILADELPHIA — Democracy can’t help but be noisy and messy. Monday night it took a nose-dive into ugly. 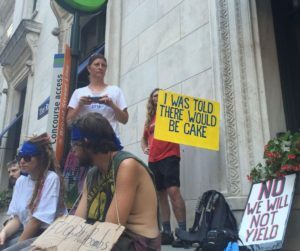 There has been no escape from supporters of Bernie Sanders’ presidential campaign for those attending the Democratic National Convention. Delegates came to cast their vote for their chosen candidate, regardless of projections for the final count. Others are here to march and demonstrate, and have repeatedly owned the streets. Most of all, they’ve come to be heard, and media voices like my own have amplified their messages of frustration, and calls for income equity. A somewhat disjointed, massive march was held Sunday. It began with a banner demanding an end to establishment politics, and encouraging delegates to “vote no on Hillary” Clinton. As the march continued, however, that message was muddied with a barrage of issues ranging from legalizing cannabis to a host of environmental concerns. Things became clearer Monday morning during an ill-fated address by DNC Chairwoman, U.S. Rep. Debbie Wasserman Schultz, of Florida. Sanders’ supporters crashed the meeting, effectively chasing her from the podium. Hundreds gathered near city hall before the convention convened to once again state their case against DNC leadership, to express dismay that Wasserman Schultz immediately jumped to the Clinton campaign and, of course, to continue to pressure the party to move further to the left. With only minor exceptions, I’ve enjoyed the show, and applaud those standing up for what they believe. Demanding Wasserman Schultz answer for her actions, and questioning why the Clinton campaign isn’t more concerned about the leaked email revelations is reasonable. I get the anger, and I appreciate the passion. But then Bernie Sanders held a rally and was booed by his own supporters so loudly that he couldn’t be heard. Convention consternation was a given, even after Wasserman Schultz was pulled. It didn’t matter that Sanders, the man these delegates say they support, requested no floor disruptions. It didn’t matter they attempted to shout down people from the demographic groups their movement claims to support. I don’t know what’s next for the Revolution, or if a late-night appeal by Sanders to evolve the movement he inspired into a political organization will be successful. But I’m convinced the last thing American politics needs is one more group that feels justified in belittling and disrespecting others on their quest toward a political dead end.